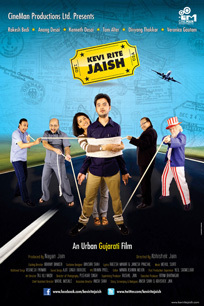 Kevi Rite Jaish is a satire on the fascination, nay, obsession of the Patels - a Gujarati farmer community -- of migrating to the USA. Over the last half a century millions of Patels have migrated to the USA and have come to dominate its Motel industry by dint of hard-work and persistence. The story revolves around one of such Patel family and its uncounted tries to immigrate to States. Shot over 32 locations across Ahmedabad, the film boasts an image of urban contemporary Gujarati film which connects with story of every Gujarat household. The film features the first ever Gujarati rock song sung by pioneer of rock songs in India, Suraj Jagan. Aishwarya and Parthiv Gohil have lent their voices for romantic duets, while new comer Vishvesh is going to surprise you with his compositions. Our very own RJ Dhvanit has sung a light hearted song introducing the film. Roop Kumar Rathod is going to take you by storm with our title song, and Mehul Surti's music adds charm to the album with variety of music. Eminent poet Raeesh Maniyar and Jainesh have penned the beautiful lyrics.